Recommended Citation: Sharp, J H and S D Ryan. 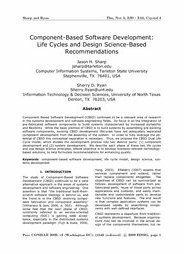 Component-based Software Development: Life Cycles and Design Science-based Recommendations. In The Proceedings of the Conference on Information Systems Applied Research 2009, v 2 (Washington DC): §1545. ISSN: 0000-0000. Component-Based Software Development (CBSD) continues to be a relevant area of research in the systems development and software engineering fields. Its focus is on the integration of pre-fabricated software components to build systems characterized by increased portability and flexibility. While the basic premise of CBSD is to build systems by assembling pre-existing software components, existing CBSD development lifecycles have not adequately separated component development from the assembly of the system. In order to fully leverage the potential of CBSD this conceptual separation is necessary. Thus, we propose the CBSD Dual Life Cycle model, which divides the development process into two distinct parts: (1) component development and (2) system development. We describe each phase of these two life cycles and use design science principles, whose objective is to develop business-relevant technology-based solutions, to help formulate recommendations for enhancing quality.